The transfer of sovereignty of Macau from the Portuguese Republic to the People's Republic of China (PRC) occurred on 20 December 1999. Macau was settled and governed by Portuguese merchants in 1535, during the Ming Dynasty (1368–1644 AD). Portugal's involvement in the region was formally recognized by the Qing in 1749. The Portuguese governor João Maria Ferreira do Amaral, emboldened by the First Opium War and the Treaty of Nanking, attempted to annex the territory, expelling Qing authorities in 1846, but was assassinated. After the Second Opium War, the Portuguese government, along with a British representative, signed the Sino-Portuguese Treaty of Peking that gave Portugal sovereignty over Macau, on the condition that Portugal would cooperate in efforts to end the smuggling of opium. After the founding of the People's Republic of China in 1949, and the transfer of China's seat to the PRC at the United Nations in 1971, foreign minister Huang Hua appealed to the UN Special Committee on Decolonization to remove Macau (and Hong Kong) from its list of colonies, preferring bilateral negotiations ending in a return of the territory, rather than the expected independence outcome. The authoritarian right-wing government of Portugal was expelled by the Carnation Revolution, a coup that occurred in 1974. Within one year, the government of Portugal withdrew troops from Macau, withdrew recognition of the Republic of China in favour of the People's Republic, and began negotiations for the return of Macau. Four conferences from June 1986 to March 1987 resulted in a Sino-Portuguese Joint Declaration on 13 April 1987 and the transfer of sovereignty on 20 December 1999. Macau is granted a high level of autonomy and the retention of its legal system by the Macau Basic Law. The history of Macau is traced back to the Qin Dynasty (221–206 BC), when the region now called Macau came under the jurisdiction of Panyu county, in Nanhai prefecture (present day Guangdong). The Portuguese arrived in the 16th century and wished to obtain rights to anchor ships in Macau's harbours and to carry out trading activities. Around 1552–1553, they obtained temporary permission to erect storage sheds onshore, in order to dry out goods drenched by sea water; they soon built rudimentary stone houses around the area now called Nam Van. In 1557, the Portuguese established a permanent settlement in Macau, paying an annual rent of 500 taels ( 20 kilograms / 44 pounds ) of silver as an annual lease. Because of the activities of Portuguese settlers and Japanese Wokou, the Ming Dynasty tightened its control over Macau between 1608 and 1614. In 1623, the Portuguese government appointed D. Francisco Mascarenhas as the Governor of Macau. At first, the governor was only responsible for the defence of Macau, and Fortaleza do Monte was constructed for this purpose. In 1749, the Qing government issued a complete set of guidelines for Portugal's administration of Macau and carved the Portuguese version on a stela in the Edifício do Leal Senado. However, the Governor of Macau, the representative of Portugal, gradually took over the power of the Senado. 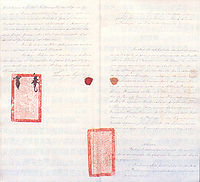 When the Treaty of Nanking was signed in 1842 between Britain and China, the Portuguese government requested the Qing government to exempt them from the ground rent. The Qing authorities refused the request, but retained the preferentials that were already given to Portugal. However, on 20 November 1845, Maria II of Portugal unilaterally declared Macau a free port in which Portugal was exempt from ground rent and allowed merchant vessels of other countries to interact freely in Macau. After the new Governor of Macau, João Ferreira do Amaral, arrived in 1846, a series of colonial policies were enforced in Macau. In May 1846, Amaral demanded that all Chinese residents in Macau pay ground rent, poll tax and property tax, which broadened Portuguese rule in Macau over the Chinese residents. The Qing authorities in Macau immediately protested against Amaral's action and attempted to negotiate. However, beginning in 1849, Amaral expelled all Qing officials from Macau, destroyed the Qing Customs and stopped paying ground rent to the Qing government. Amaral's actions enraged the Chinese residents further, and he was assassinated on 22 August 1849. In 1862, the Portuguese and Qing governments signed the draft of the Sino-Portuguese Peaceful Trade Pact. However, the Portuguese had the intention of annexing Macau with this pact. The intention was discovered and negotiations were stopped. The topic was not brought up again until 1886, when the Portuguese representative, along with the British representative, opened negotiations with the Qing government once again. Promising that they would cooperate on the anti-smuggling of opium, the Qing and Portuguese governments signed the Sino-Portuguese Treaty of Peking and the Sino-Portuguese Peaceful Trade Relation Pact. These treaties stated that, "Agreed by China, Portugal will remain in Macau and administer its land the same way Portugal administers other places". However, to avoid the total loss of sovereignty, the Qing government reserved the right to prevent Portugal from transferring Macau to another country. If Portugal were going to transfer Macau to another country, they would require the permission of the Chinese government. The questions of Hong Kong and Macau belong to the category of questions resulting from the series of unequal treaties which the imperialists imposed on China. Hong Kong and Macau are part of Chinese territory occupied by the British and Portuguese authorities. The settlement of the questions of Hong Kong and Macau is entirely within China's sovereign right and do not at all fall under the ordinary category of colonial territories. Consequently they should not be included in the list of colonial territories covered by the declaration on the granting of independence to colonial territories and people. With regard to the questions of Hong Kong and Macau, the Chinese government has consistently held that they should be settled in an appropriate way when conditions are ripe. The same year, on 8 November, the United Nations General Assembly passed the resolution on removing Hong Kong and Macau from the official list of colonies. This created the conditions for the Chinese government to solve the sovereignty issues of Hong Kong and Macau peacefully. On 25 April 1974, a group of low-ranking Portuguese officers organised a coup d'état, overthrowing the right-wing ruling government that had been in power for 48 years. The new government began the democratisation process. The new Portuguese government carried out de-colonization policies, and proposed Macau's handover to China. On 31 December 1975, the Portuguese government withdrew its remaining troops from Macau. President António Ramalho Eanes attended the General Assembly of the United Nations a year later, and discussed with the Chinese representative, Huang Hua, the establishment of diplomatic relations between Portugal and China, and issues of Macau. After two years of discussions, the Portuguese government decided to break off diplomatic relations with the Republic of China on 8 February 1979, and established diplomatic relations with the People's Republic of China the next day. Both Portugal and the People's Republic of China recognised Macau as the territory of China, and the exact time for its return and other details would be discussed later between the two sides. After Portugal and the People's Republic of China formally established diplomatic relations, officials of the two countries began to visit each other. In March 1980, the Governor of Macau, Nuno Viriato Tavares de Melo Egídio, accepted an invitation from Beijing and visited China. As the relationship between Portugal and China developed, their heads of state began to visit each other also. In November 1984, the President of the People's Republic of China, Li Xiannian, made a visit to Portugal and met the President of Portugal, António Ramalho Eanes, to exchange opinions on the issues of Macau. In May 1985, Eanes returned the favour by visiting China and met the de facto leader of China Deng Xiaoping, and expressed his desire to solve the issues of Macau in a friendly manner. Britain and China reached a consensus on the sovereignty question of Hong Kong, which was more complex in its nature. The consensus included the draft of the Sino-British Joint Declaration. Likewise, Sino-Portuguese relations developed steadily, and solving the question of Macau through negotiation was gradually made possible. On 20 May 1986, the People's Republic of China, along with Portugal, officially announced that talks on Macanese affairs would take place in Beijing on 30 June 1986. The Portuguese delegation arrived in Beijing in June, and was welcomed by the Chinese delegation led by Zhou Nan. On 13 April 1987, the Joint Declaration on the Question of Macau by the governments of the People's Republic of China and the Portuguese Republic was formally signed by the Prime Ministers of both governments in Beijing. The twelve years between the signing of the "Sino-Portuguese Declaration" on 13 April 1987 and the transfer of sovereignty on 20 December 1999 were known as "the transition". On 15 January 1988, the Chinese Foreign Affairs Department announced the Chinese members of the groups that would begin the talk on the issues of Macau during the transition. On 13 April, the "Draft of the Basic Law of the Macau Special Administrative Region Committee" was established during the seventh National People's Congress, and on 25 October, the committee convened the first conference, in which they passed the general outline of the draft and the steps, and decided to organise the "Draft of the Basic Law of Macau Special Administrative Region Information Committee". On 31 March 1993, the National People's Congress passed the resolution on the Basic Law of Macau, which marked the beginning of the latter part of the transition. In the afternoon of 19 December 1999, the 127th Portuguese Governor of Macau Vasco Joaquim Rocha Vieira lowered the flags in Macau, which was the prelude of the ceremony for the establishment of the Macau Special Administrative Region. The official transfer of sovereignty was held at midnight on that day at the Cultural Center of Macau Garden. The ceremony began in the evening and ended at dawn of 20 December. The evening of 19 December began with dragon and lion dances. These were followed by a slideshow of historical events and features of Macau, which included a mixture of the religions and races of the East and the West, and the unique society of native Portuguese born in Macau. In the final performance, 422 children who represented the 422 years of Portuguese history in Macau were presented along with several international stars to perform the song "Praise for Peace". The transfer of the sovereignty of Macau was a significant historical event in Macau, as it returned Macau to China. Because the transfer and the idea of one country, two systems were considered to be successful, the Macau Special Administrative Region, the Legislative Assembly and the Judiciary were all put into practice accordingly under the regulation of the Basic Law. The steady growth of the Macau Special Administrative Region benefited from the support of the government of China. Since the establishment of the region, public security has been improved and the central government even designated Macau as the city for expansion of gambling-related tourism. The introduction of the Individual Visit Scheme policy made it easier for Chinese mainland residents to travel back and forth. In 2005 alone, there were more than 10 million tourists from mainland China, which made up 60% of the total number of tourists in Macau. The income from the gambling houses in Macau reached almost US$5.6 billion. On 15 July 2005, the Historic Center of Macau was listed as a World Cultural Heritage site. The increasing development of tourism became a major factor in the rapid development of the economy of Macau. Portuguese remained an official language. Chinese had been made an official language in 1991. Public signs are bilingual in Portuguese and Traditional Chinese, although signs may also include English. However, many schools teach in Cantonese in parallel with Mandarin and Portuguese. The legal system remained separate from that of mainland China, broadly based on the Portuguese civil system, with some Portuguese judges continuing to serve. Macau retained the pataca as its currency, which remained responsibility of the Monetary Authority of Macau, and pegged to the Hong Kong dollar. However, the Bank of China began issuing banknotes in 1995. The border with the mainland, while now known as the boundary, continued to be patrolled as before, with separate immigration and customs controls. Macau citizens were still required to apply for a Mainland Travel Permit, in order to visit mainland China. Citizens of mainland China still did not have the right of abode in Macau, except if he/she was born in Macau (before or after the establishment of the SAR). Instead, they had to apply for a permit to visit or settle in Macau from the PRC government. Macau continued to operate as a separate customs territory from mainland China. It remained an individual member of various international organisations, such as APEC and WTO. Macau continued to negotiate and maintain its own aviation bilateral treaties with foreign countries and territories. These include flights to Taiwan. Macau remained an individual member of sporting organisations such as FIFA. However, the Sports and Olympic Committee of Macau, China, while a member of the Olympic Council of Asia, is not a member of the International Olympic Committee. It continued to drive on the left like its colonial power Portugal. Unlike Mainland China, which drives on the right, Portugal and the other colonies switched to the right in 1928. Vehicle registration plates continued to follow the old Portuguese format, with white characters on a black plate. This had been discontinued in Portugal in 1992. Macau-registered vehicles could travel to and from mainland China, but required special cross-border plates, similar to those of Guangdong. Macau citizens continued to have easier access to many countries, including those in Europe and North America, with Macau SAR passport holders having visa-free access to 117 other countries and territories. Foreign nationals, including Portuguese citizens, were allowed to hold high-level positions in the administration, except the office of Chief Executive; those who will apply for Chief Executive position would have to be naturalised as Chinese. This was in contrast to Hong Kong, where such positions were restricted to citizens of the SAR. Members of the existing Legislative Assembly who had been elected in 1996, remained in office until 2001, although those who had been appointed by the Governor were replaced by those appointed by the incoming Chief Executive. Foreign nationals, including Portuguese citizens, were still allowed to stand for directly elected seats in the Legislative Assembly. This was in contrast to Hong Kong, where foreign nationals could only stand for indirectly elected seats in the Legislative Council. Macau continued to have more political freedoms than mainland China, with the holding of demonstrations and annual memorials to commemorate the Tiananmen Square protests of 1989 in Senado Square. However, pro-democracy politicians and academics from Hong Kong were refused entry. It continued to have more freedom of the press than mainland China despite the growing influence of Beijing and Hong Kong journalists being refused entry. Macau continued to have its own civic groups participating in the political system. These are separate from the Communist-led United Front on the mainland. It also continued to have more religious freedoms, with the Roman Catholic Diocese of Macau remaining under the jurisdiction of the Holy See, instead of the Chinese Patriotic Catholic Association on the mainland. However, the Falun Gong spiritual practice has faced restrictions. Macau retained a separate international dialling code (853) and telephone numbering plan from that of the mainland. Calls between Macau and the mainland still required international dialling. It retained different technical standards from mainland China, such as British-style electrical plugs. However, Macau would later adopt the digital TV standard devised in mainland China, instead of DVB-T, replacing PAL-I for TV transmissions. Macau retained a separate ISO 3166 code, MO. It also retained a top-level domain, .mo. However, the Chinese code CN-92 was also used. It retained its own separate postal services, with Correios de Macau operating separately from China Post. Macau was not made part of the Chinese postcode system, nor did it introduce a postcode system of its own. Portuguese-influenced place names remained unchanged, although their unrelated Chinese equivalents were already in use; for example, Avenida Almeida Ribeiro is known as San Ma Lou or "new street of horses". Portuguese monuments remained, although the statue of former Governor João Maria Ferreira do Amaral was taken down in 1992. The statue is now located at the Bairro da Encarnação, Lisbon, Portugal, where it was placed in December 1999. The floor on the ground level continued to be officially referred to by the Portuguese abbreviation R/C (rés-do-chão). The Chief Executive of Macau became the head of government, elected by a selection committee with 300 members, who mainly are elected from among professional sectors and business leaders in Macau. The Governor was appointed by Portugal. The former Governor's Palace was now known as the Government Headquarters. The Court of Final Appeal became the highest court of appeal in Macau. This replaced the Superior Court of Justice, established in April 1993. Appeals to the Court of Appeal of the Judiciary District of Lisbon ceased in 1999. All public offices now flew the flags of the PRC and the Macau SAR. The Flag of Portugal now flew only outside the Portuguese Consulate-General and other Portuguese premises. 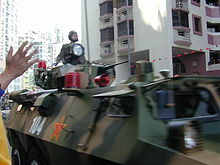 The People's Liberation Army established a garrison in Macau, the first military presence there since the Portuguese military garrison had been withdrawn following the Carnation Revolution in 1974. The Central People's Government was now formally represented in Macau by a Liaison Office. This had been established in 1987 as a branch of Xinhua News Agency, when Macau was under Portuguese administration. Before 1987, it was informally represented by the Nanguang trading company. The Macau SAR Government was now formally represented in Beijing by the Office of the Government of the Macau Special Administrative Region. Elsewhere, the Macau SAR Government was now represented by Macau Economic and Trade Offices in Lisbon (Portugal), Brussels (European Union), Geneva (World Trade Organization) and Taipei (Taiwan). The Ministry of Foreign Affairs of the People's Republic of China was represented in Macau by a Commissioner. The Municipalities of Macau and the Ilhas, which had been retained provisionally following the transfer of sovereignty, were abolished and replaced by the Civic and Municipal Affairs Bureau with effect from 1 January 2002. The Taipei Trade and Tourism Office, the de facto mission of Taiwan, was renamed the Taipei Trade and Cultural Office, and was allowed to issue visas in 2002. It was later renamed the Taipei Economic and Cultural Office in Macau in 2011. The words "República Portuguesa" no longer appeared on postage stamps, which now displayed the words "Macau, China". The Portuguese coat of arms had already been removed from Macanese pataca banknotes and coins issued since 1988. The Macau Police badge now displayed the Macau SAR emblem. The Portuguese honours system was replaced by a local system, with the Grand Medal of Lotus Flower as the highest award. Public holidays changed, with Macau SAR Establishment Day being introduced and Portuguese-inspired occasions, such as the Republic Day, and Freedom Day being abolished. PRC National Day had been made a public holiday in 1981. Macau's aircraft registration prefix changed from Portugal's CS to B, as used by mainland China, Taiwan and Hong Kong. The Portuguese national anthem A Portuguesa, was no longer played after closedown on television stations. The Chinese national anthem, March of the Volunteers was now played instead. A giant golden statue of a lotus, erected in a public space outside the Macau Forum named Lotus Square, was presented by the State Council of the People's Republic of China to commemorate the return of Macau to Chinese sovereignty. The University of Macau was relocated to a new campus on Hengqin Island in 2009. This was under the jurisdiction of the Macau SAR government, which had leased a plot of land for M$1.2 billion until 2049. ^ "João Ferreira do Amaral". Sítio da Câmara Municipal de Lisboa. Lisbon City Hall. Retrieved 1 October 2017. A mudança da administração do território macaense implicou a transferência da estátua para Lisboa, que foi inaugurada no Bairro da Encarnação, em Dezembro de 1999. ^ Wallace, Charles P. (21 July 1989). "Portugal Offers Citizenship to Many in Last Colonial Outpost : Macao, a 'Poor Relation,' Draws Envy of Hong Kong". Los Angeles Times. Retrieved 3 October 2018. Lai, Pauline Pou San. "Civil service training in the Macau Government" (Chapter 7). In: Podger, Andrew and John Wanna (editors). Sharpening the Sword of State: Building Executive Capacities in the Public Services of Asia-Pacific. ANU Press, 2016. ISBN 9781760460723 (paperback), 9781760460730 (ebook). HTML version of the chapter.